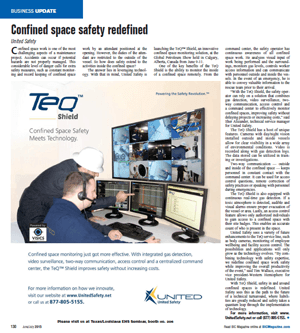 BIC magazine recently published the article “Confined space safety redefined” in their June/July edition. The article mentions how challenging confined space work can be, and how additional safety measures must be in place to prevent accidents. It then goes on to discuss how technology can play an important role in making confined spaces safer. It mentions our recent launch of TeQ™ Shield, describing the main features of this system that combines access control, two-way communications, continuous gas detection and video surveillance to allow remote monitoring of all confined space work from inside a command center. The article goes on to explain the plans for the development of the technology at United Safety, such as integrating body cameras, monitoring of employee wellbeing and facility access control. Tim Wallace, executive vice president-Western Hemisphere for United Safety concludes the article stating that “by combining technology with safety expertise, we redefine confined space work safety while improving the overall productivity of the event”.